I slept in on Sunday until 8 am. It was so nice. We slowly woke up and when we got downstairs the others had coffee made. Such a treat! We barely got to say good morning and they were off. I did not have to anywhere until my class at 1:30 so had some breakfast, and settled in with a tea and my reversible cable project. What a beautiful way to start the day. We cleaned up the cottage and checked out before heading up to the Algonquin for Brunch. We met Moria and our “lucky baby” and went to the dining room. 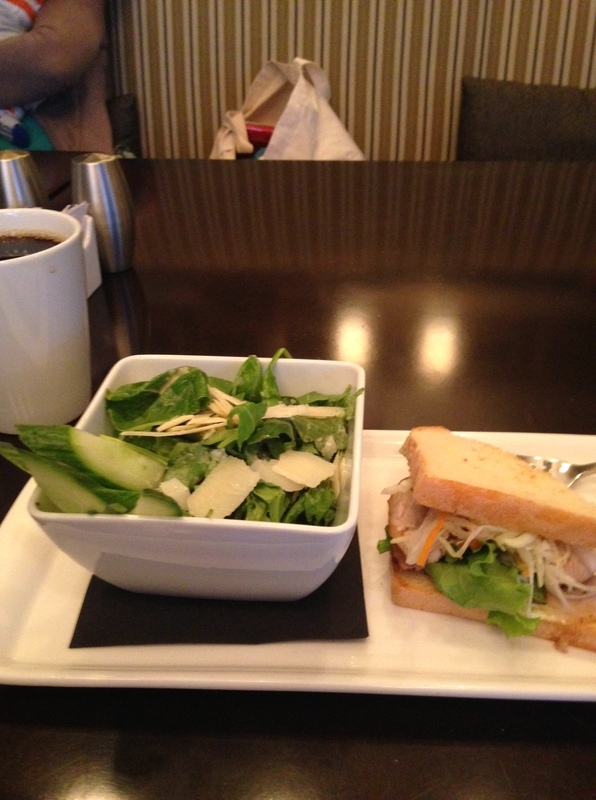 The soup and sandwich both had things I could not eat, so the chef made me a special salad and a gluten free smoked pork sandwich. I am not always one for pictures of my food but I did for this. It was so good. Then I went to “Knitting for Speed and Efficiency” by Stephanie Pearl-MacPhee. I could listen to Stephanie for days. She’d make anything fun which was good because changing 37 years of bad habits was going to be hard and she only had one afternoon. I know she said we had to be kind to ourselves, but it is so slow learning to be fast. The slides were great. Following the history of knitting was very interesting and made me really think about how I sat and held my needles. I absolutely loved her “Aura of Confidence” pictures. “If they are knitting with only one needle. They can’t knit.” Uh Duh! It was a fun way to review how we held our needles and bodies while we knit. It was a great pairing with the Yoga I did the day before. After showing us the world’s fastest knitters, three of whom where lever knitters, we tried doing it ourselves with one long needle tucked under our arm. Here is a video of the Yarn Harlot demonstrating Irish Cottage Knitting. I am still doing it daily though but am nowhere near my top speed let alone how fast Stephanie is here. It may be coming but man is it frustrating. It made me feel for my own students. Probably a good thing for us professors to do something completely different so we have more empathy for our poor students.